All plugin source code and headers for the SkookumScript C++ API are available via GitHub. We haven’t moved all of the comments from cpp files to hpp files yet, so if something is not clear please ask! Make sure to download for the version UE4 and for the version of the SkookumScript plugin that you are using. You must agree to the usual legal yada-yada that accompanies any kind of software. 3.0.1856 Beta with bug fixes and updated demo! 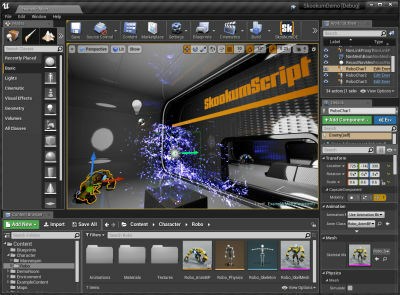 Supercharge Unreal Engine 4.11 with the latest SkookumScript plugin for it - 3.0.2391 Beta is out! Hello 3.0.5093 with support for event dispatchers, delegates, Blueprint functions, custom events, name collision resolution and more! 4.15.0 Preview 1 is out and so is SkookumScript 3.0.3838! 3.0.1897 Beta - get your hands on it! 3.0.2234 Beta brings SkookumScript to your Android device! 3.0.4135 is here and it has the new SkookumIDE! Get the SkookumScript UE4 Plugin! 3.0.1897 Beta is here with Blueprint structs, default arguments and more! 3.0.2983 hot off the press - C++ projects now supported by engine plugin + FireBot, our brand new C++ project demo! Unreal Engine 4.13 Preview 1 now supported! Double Question! Can blueprint nodes made by skookum have returns? And is there a way to get the closest actor from instances? A new version of UE4 is out - and so is a new version of SkookumScript - Hello 3.0.3376! SkookumScript 3.0.4885 is out! 4.16 support, user defined enums and more!